Instead of giving out one pen, what about a two-in-one? Put a little pep in your customers pen with this Soft Touch Stylus Pen. Not only does it write comfortably, flip it around and use the sleek stylus tip on your phone or tablet. Your customers will love the look and feel of these upscale pens! To keep your brand fresh on a customers’ mind, put your logo on something they’ll use for that important business presentation. You’ll impress your customers with this quality USB drive and keep your brand name front and center. Even though flu season is coming to its end, your clients will always appreciate a way to keep their hands clean throughout the day. This hand sanitizer comes in a sleek gel holder which is perfect for attaching anywhere for maximum convenience! The best promotional items do at least two things: raise the profile of your brand and give the recipient real value. 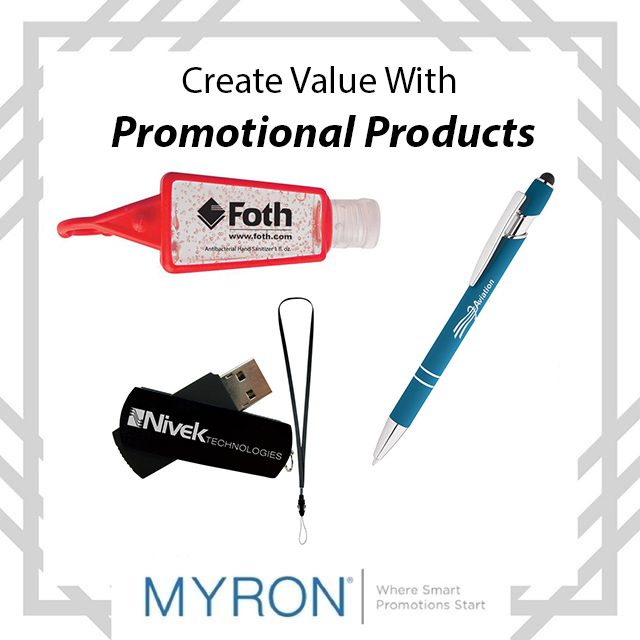 At Myron, we carry a wide variety of promotional products to get the word out about your company!